Psion were an early pioneer in handheld computing, launching the Psion Organiser range in the mid-1980s and then following it up with more sophisticated devices. 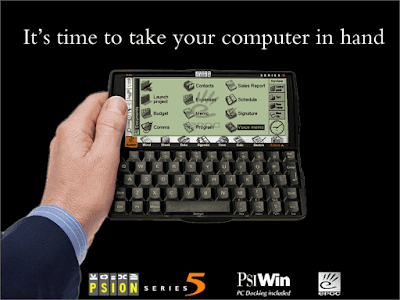 This lead to the Psion Series 5, launched in 1997. which was quite possibly the best device that Psion even made. The technology of the late 1990s looks primitive compared to today, but the Series 5 certainly managed to squeeze a lot into a tiny form factor. Looking a bit like a pencil case from the outside, the Series 5 opened up to reveal a basic 5.6" 640 x 240 monochrome touchscreen (about the same size as a high-end smartphone of today), but the clever part was the keyboard. Opening the case made the keyboard slide forward, which counter-balanced the touchscreen and made it easier to type. These relatively large keys had a good amount of travel and it was feasible to touch-type on it. The operating system was EPOC32, which in time became Symbian. Inside was an 18MHZ ARM processor with 4 or 8MB of RAM at launch, defending on configuration. Data could be stored on CompactFlash cards and the Series 5 could communicate via infra-red which was all the rage at the time. Power was provided by two AA batteries which could keep the Series 5 going for up to 35 hours and a button cell provided back-up for the memory. The built-in applications were another strong point, with a competent suite that was compatible with industry standards of the time. A range of other applications were available too, making the Series 5 a very popular tool for gadget-savvy professionals and consumers alike. The high-end version was priced at £500 including tax (equivalent to about £860 today). 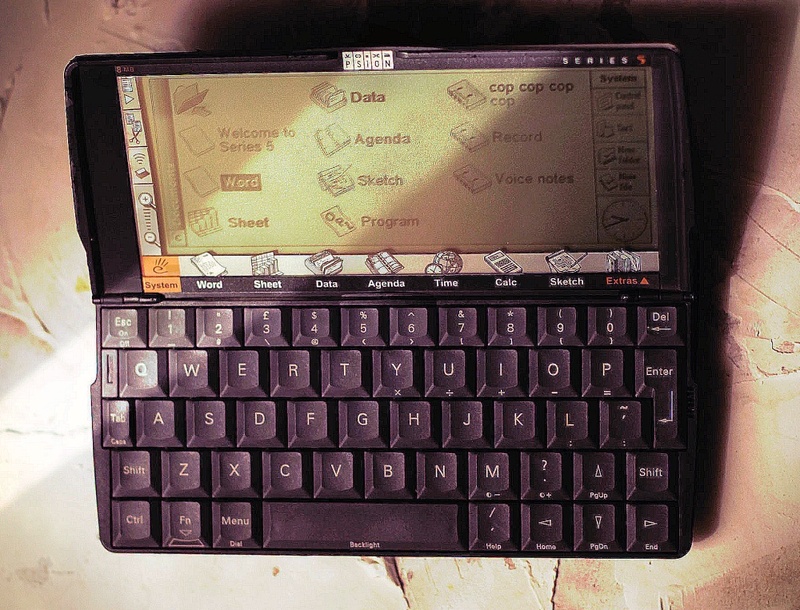 In 1999 the upgraded 5mx came out with slightly better hardware and software, including a web browser. A simplified version of the Series 5 called the Revo also came out in the same year. Despite some quirks and bugs, and the odd bit of fragile hardware it seemed that Psion was ready to conquer the world. But it didn't happen. In 2001 with a very strong position in the handheld computing market and a number of promising devices in the pipeline, Psion suddenly killed off its consumer electronics division. Instead, Psion decided to concentrate on industrial and business handheld devices through its newly-acquired Teklogix division. In the turmoil that followed, many engineers and designers departed the company to new ventures, but perhaps most importantly the EPOC operating system was spun off to become Symbian, the operating system that dominated the smartphone market for years afterwards. Among the killed-off products were early smartphones, music players and satellite navigation devices. All of these were to boom a few years later, but they must have seen like a high-risk proposition at the time. A more complete picture of the turmoil at Psion at this time can be found in this long story published a decade ago by The Register. Psion's move was maybe good business sense but it was also a huge loss to see this pioneering and successful British company suddenly deciding to play it safe. As it was, Psion continued as an independent entity until 2012 when it was bought out by Motorola Solutions, and in 2014 that division was in turn was bought by Zebra Technologies. Even now the Psion Series 5 still has fans, and software and accessories are still available - there are even companies and people who will service them and fix common faults (typically the screen cable breaking). On the second-hand market the 5mx in good condition will typically cost more than £100 / €115 up to several hundred pounds for one in "as new" condition. The original Series 5 is a bit cheaper, the rarer 5mx Pro a little more expensive. It's still quite a usable device today, especially if you prefer a real keyboard to work from.